The E-Tronic® 80 offers a new, contemporary design option for commercial restroom applications. With above-deck electronics, including models with integrated scald protection, the E-Tronic 80 eliminates clutter below the deck to enhance the overall design of the room. 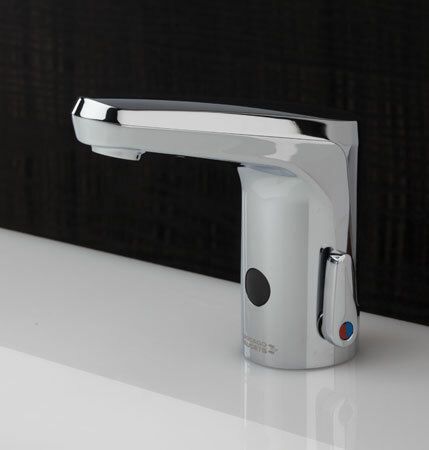 Internal mixer: Available with optional thermostatic protection. Also available as single supply. User adjustable mixer: Available with optional thermostatic protection. Contemporary design with dependable touch-free convenience. Easy to adjust: Optional Commander™ handheld unit delivers a new level of control from the palm of your hand. Versatile design: Available with user adjustable temperature control plus 4˝ and 8˝ cover plates to meet any application. Saves water: Adjustable run time with vandal resistant outlet options from 0.35 to 1.5 GPM. Easy to install and service: Electronic components are above-deck for faster installation and easier maintenance. Added safety: Available with an integral ASSE 1070 compliant thermostatic protection to help prevent scalding. Coming Soon! 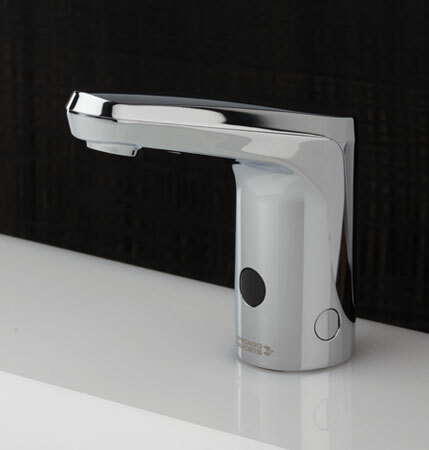 Contact your Chicago Faucets Sales Representative for more information. Interested in learning more? Download our free sell sheet for complete details.